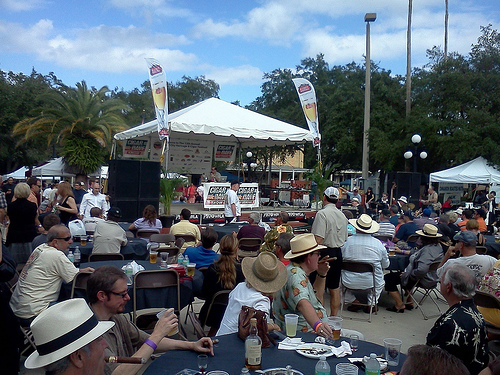 Cigar Paradise came to Earth on November 19 in the form of the Ybor City Heritage and Cigar Festival, an annual event held in the center of Ybor City just outside downtown Tampa. Cigar Dave broadcasting live, a celebrity appearance by Rocky Patel himself, dozens of cigar vendors with special deals, a classic car show, a live band rocking some Sinatra, tents selling beer and burgers, and the sweet smell of burning stogies everywhere might be how you imaged cigar smokers’ heaven, and I can tell you that’s exactly what it was. As soon as I arrived on this festive scene I lit an Urbano Corojo and began soaking up the sites. Over 2,000 were in attendance and though it was a packed house, there was plenty of room to maneuver and see everything that needed to be seen. Cigar retailers and manufacturers had set up tents all over the place, nearly all of them advertising specials and discounts on their products. As the voice of Cigar Dave boomed across the festival and patrons consumed Cuban food and discussed their favorite tobacco blends, I found myself browsing the tents and encountered deals everywhere I looked. Upmann 4-pack samplers were selling for as low as $12 and you could find practically any kind of Cuesta Rey for around $5 a stick. I saw 24-pack sampler boxes sold in cedar humidors for $99, the Rocky Patel tent was stacked with boxes and boxes of stogies, and the Arturo Fuente tent displayed a large sampling of their line (a box of the 8-5-8 was nearly sold out). Cigar Rights of America was there signing up tons of new members and I found several vendors who didn’t sell anything even remotely related to cigars but had purchased tables to take advantage of the large crowd. The center of the attraction was Cigar Dave’s stage. With dozens of tables surrounding him and a live band sitting ready to burst into a medley of classic show tunes, many patrons were happy to sit and smoke cigars while listening to Cigar Dave who was joined on stage by Rocky Patel. 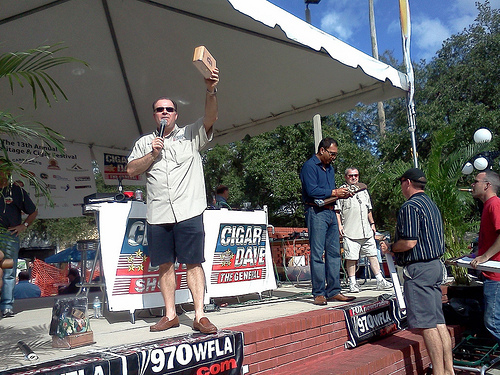 Later on Cigar Dave hosted an auction, selling everything from boxes of premium cigars to autographed footballs to expensive pieces of jewelry. Here he is auctioning a box of 1976 Arturo Fuente Don Carlos brand cigars while Mr. Patel stands to the side signing autographs and posing for photos with fans. The ’76 Fuente cigars sold for $425 and demand was enough that the Fuente family put a second box of 76ers on the auction block and sold them too. Other attractions included three Tampa Humidor tents, one including sofas and a large screen TV. A classic car show that boasted several beauties including a pristine ’65 Mustang in white and a spotless light blue ’57 Chevrolet Bel Air. The buzz on the street was that over 2,000 were in attendance and everywhere you went you could hear men exchanging philosophies on cigar flavors, blends, sizes and prices. There was a lot of excitement in all corners of the festival and a lot of energy throughout the day. With ideal weather for an outdoor festival it was the perfect way to spend a Saturday afternoon. The highlight for me was that I was fortunate to shake hands with Rocky Patel and have my picture taken with the man himself. As I climbed to the stage I offered my hand and said, “Mr. Patel, I enjoy your stogies very much.” Patel, with a kind smile on his face, replied modestly as we shook hands. “Thank you, I appreciate hearing that.” He stood patiently and posed while my father fiddled with the camera, never impatient, never rushed. My impression was that Patel was as happy to be there as all of the patrons and vendors. 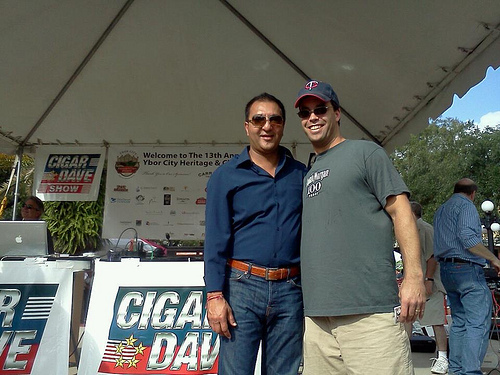 He may be the Don of a lucrative cigar empire and I a lowly cigar blogger, but on that day I realized that not only were Rocky Patel and I both brothers of the leaf, we always have been. And that brotherhood, that unspoken camaraderie among cigar enthusiasts is what makes a celebration like the Ybor City Cigar Festival such a special event. Thanks for a great day, Tampa. I’ll surely see you soon. This event was a blast. Thanks for the write-up…can't wait for next year's festival. And for those of you who have never made a pilgrimage to Ybor City, make sure you do so soon. It’s a can’t-miss trip for BOTLs. I didn't even know this event existed. Looks pretty cool. May have to go next year.